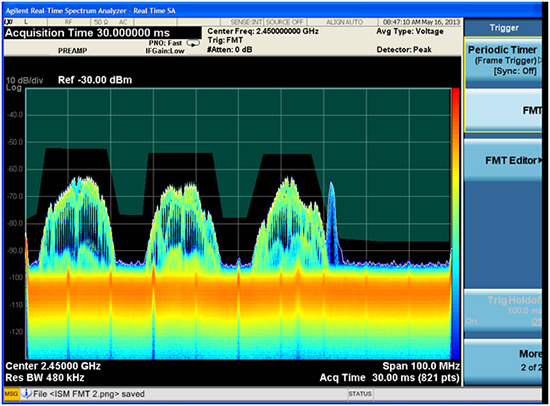 Figure 1: Keysight MXA signal analyzer with 160 MHz bandwidth and real-time spectrum analysis. In test equipment for wireless applications, the technology we leverage and extend can be as important as the new technology we deliver. The latest capabilities for the Keysight MXA X-Series signal analyzer provide several good examples. Real-time spectrum analysis and frequency mask triggering. For each of the new analysis bandwidths, a real-time spectrum analyzer option is available. When the agility of modern wireless signals intersects with increased density and chaos in some signal bands, the tasks of a designer become more challenging and multi-dimensional. Unlike other manufacturers who offer only dedicated real-time analyzer tools, Keysight provides solutions as lower-cost upgrades or options to existing MXA and PXA signal analyzers. Integrating frequency mask triggering with vector signal analysis for advanced signal capture and demodulation. Spectrum analysis, even when performed in real time, is a limited view of the behavior of signals and signal environments. While real- time spectrum analysis is a powerful tool for discovering elusive signal behavior, the task of troubleshooting and optimization requires deeper and more flexible analysis. This includes vector signal analysis (time domain and demodulation), signal capture and playback for flexible post-processing, and the ability to pass captured signals to other processes and tools for further analysis. Keeping up with technology via upgrades, updates and retrofits. 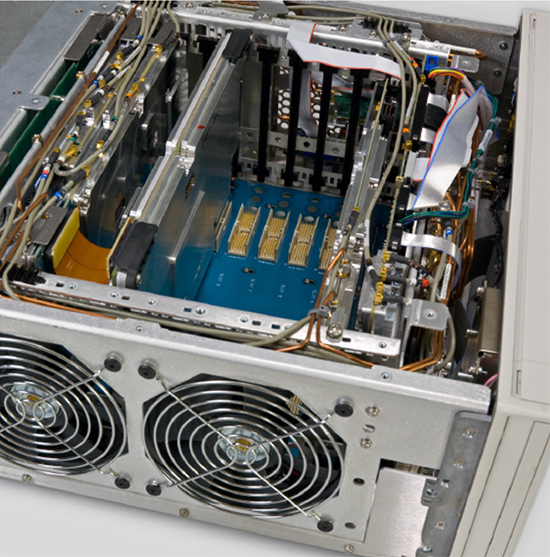 The pace of technology improvement is fast for both Keysight and our customers, but careful design on our part can keep our customer’s investment from being left behind. The MXA was the first of Keysight’s X-Series signal analyzers and was introduced in 2006. That’s a long time ago in the world of wireless connectivity but even MXAs from 2006 can be upgraded to the wide bandwidths, real-time analysis, and advanced triggering that are described here. At introduction in 2006, the widest bandwidth available in the MXA was 25 MHz. Considering the industry’s already established and persistent trend toward wider bandwidths, Keysight’s designers chose a modular approach to the analog and digital processing chains that allowed considerable room to grow. Bandwidth in signal analyzers requires more than the appropriate analog down-conversion, filtering, and ADC speed. These are vital elements but analyzers that support advanced processing such as FFT and swept measurements, demodulation, and real-time or vector signal analysis also require flexible sample processing (often several types of digital signal processing) to keep up with the stream of digitized samples. For example, in Keysight signal analyzers the signal samples are processed with time or frequency domain corrections, decimation, resampling, and additional filtering. This processing is done with a combination of Keysight ASICs and off-the-shelf FPGAs. Fortunately ADC sample rates and DSP throughput have been improving faster than general performance in analog circuits. (A concept predicted by Gordon Moore in 1965! ). This long-term trend was part of the X-Series modular design, and therefore, the analyzers are structured to enable widening IF bandwidth through sampling rate and DSP improvements on a single, upgradable assembly in the analyzer. Figure 2: The modular structure of the X-Series signal analyzers supports a wideband digital IF module, including high-speed DSP resources for real-time signal processing. This module, and real-time spectrum analysis, can be retrofitted to analyzers that were not originally equipped. With an eye toward future signal processing needs, the MXA’s first optional wideband digital IF assembly (introduced in 2010) covered bandwidths to 40 MHz and included an Keysight-designed signal processing ASIC and a large, fast FPGA. In a real-time MXA, Keysight configures these resources to include a fast FFT spectrum processor that produces almost 300,000 spectra per second at variable time-record lengths of up to 1024 points. With this processing power, the MXA can provide real-time results up to its full 160 MHz of bandwidth, including overlap processing to improve amplitude accuracy and probability of intercept. The MXA also provides several types of customizable displays to make the most of the flood of spectral information. The color density or histogram display is perhaps the most characteristic of real-time analyzers, providing instant insight into the frequency of occurrence of spectral phenomena. The spectrogram display is also commonly used with real-time analyzers, substituting a time axis for the histogram view. The MXA display can also be configured for a power versus time (PVT) signal view, showing the total RF envelope power of the selected frequency span. If needed, multiple measurement types can be configured on a single display, providing insight into several dimensions at once (ie., time and frequency, time and power, etc.). More information about real-time spectrum analysis and technical innovations can be found at http://www.keysight.com/about/newsroom/tmnews/background/real-timePXA/. Figure 3: Real-time spectra are often displayed in a density or histogram format (left) to reveal agile, elusive or unexpected signals. The real-time results can also be shown in spectrogram and power versus time displays (right) to reveal signal behavior versus time. The same processing power that provides real-time spectrum also can be used to evaluate successive signal spectra (hundreds of thousands/second) in real time against trigger conditions such as spectral limits or masks, including logic that detects combinations of signal behavior where the signal enters or leaves a user-defined mask. The result is a spectrally-sensitive trigger capability, usually known as a frequency mask trigger. Such a trigger can cause one or many spectrum measurements to be displayed and can solve the very difficult problem of detecting rare and/or complex events, where simpler triggers are not sufficiently selective or specific. The frequency mask trigger is especially useful in modern wireless applications with frequency bands containing multiple signals and where the individual signals are pulsed or bursted as a way to share scarce spectrum resources. The frequency mask trigger can continuously monitor a band of interest for a specific power level and spectral shape to find a signal of interest among many others. Figure 4: The frequency mask trigger (FMT) capability uses gap-free spectrum analysis to generate a trigger based on spectrum results. Here a mask is drawn to exclude wideband WLAN signals and trigger on a signal from a narrowband signal such as a cordless phone . The frequency mask trigger is also an effective tool for evaluating the agility and instability of signals during frequency or amplitude changes, whether simple channel changes or scanning, or advanced hopping schemes. The triggering evaluates millions of spectra quickly to exhaustively analyze behavior and spot problems that would otherwise be difficult to see and isolate. Real-time analysis is an excellent tool for finding elusive signals or detecting signal behavior that is brief or rare. However, real-time analyzers are limited to scalar results such as power spectrum or RF envelope. The established and effective tool for deeper analysis and troubleshooting is vector signal analysis, providing comprehensive time domain analysis and advanced vector functions such as analog and digital demodulation. With gap-free time capture and flexible post processing, vector signal analyzers can provide another type of real-time analysis. Indeed, their ability to use extensive and adjustable overlap and optimized FFT windows during playback allow them to extract the maximum amount of information from any signal they can capture. Combining a real-time MXA with 89600 VSA software fills an important gap: Triggering on elusive signals or events where other (typically magnitude-based) trigger types cannot. This single-box solution will identify signals or events of interest and initiate any measurement or time capture. Once a signal or event has been captured it can be re-analyzed in any mode supported by the VSA software. Since the VSA software also includes resampling and filtering algorithms, the signal can be processed to change the analysis center frequency and span, isolating any portion of the captured spectrum for analysis. This allows any signal or burst in the capture file to be selected for analysis such as digital demodulation, with other signals filtered out or included as needed. Figure 5: The captured frequency band (left) includes WLAN and Bluetooth® signals. After capture, the center frequency and span can be changed to isolate the FSK Bluetooth signal for demodulation (right). The captured signal file can be exported in its original form or at new center/span frequencies to other analysis or simulation tools. For example a real-world signal selected from a captured event can be sent to an RF signal generator for reproduction as an arbitrary waveform or it could be used directly in tools such as MATLAB or Keysight’s SystemVue. The Keysight MXA signal analyzer was the first of four X-Series signal analyzers and has been part of productive solutions to wireless challenges since its introduction in 2006. The MXA has remained a leading-edge tool in a wide range of wireless applications despite rapid technology evolution because of its flexible, upgradable, “future-ready” architecture. Even the earliest MXAs can be upgraded in both hardware and software to the current levels of functionality and bandwidth, maximizing capital investment. For designers and manufacturers coping with (or taking advantage of) fast technological change, the upgradable MXA signal analyzer continuously adapts to meet their business needs. Benefits of this approach are summarized in the figure below. Around the time of its introduction the MXA supported six to eight measurement applications. It currently supports 49 measurement applications, many periodically updated for compatibility with evolving standards such as LTE or IEEE 802.11. Up to 160 MHz analysis bandwidth enables the MXA to analyze the increasingly complex signals in the next-generation wireless standards, and coupled with real-time spectrum analysis, allows it to see and capture time-varying spectrum in the communications signal environment, either in design, troubleshooting, or signal monitoring.